Model of the C60 fullerene (buckminsterfullerene). Model of the C20 fullerene. Model of a carbon nanotube. C60 fullerite (bulk solid C60). A fullerene is an allotrope of carbon whose molecule consists of carbon atoms connected by single and double bonds so as to form a closed or partially closed mesh, with fused rings of five to seven atoms. The molecule may be a hollow sphere, ellipsoid, tube, or many other shapes and sizes. Graphene (isolated atomic layers of graphite), which is a flat mesh of regular hexagonal rings, can be seen as an extreme member of the family. Fullerenes with a closed mesh topology are informally denoted by their elemental formula Cn, often written Cn, where n is the number of carbon atoms. However, for some values of n there maybe more than one isomer. The family is named after buckminsterfullerene (C60), the most famous member, which in turn is named after Buckminster Fuller. The closed fullerenes, especially C60, are also informally called buckyballs for their obvious resemblance to the standard ball of association football ("soccer"). Nested closed fullerenes have been named bucky onions. Cylindrical fullerenes are also called carbon nanotubes or buckytubes. The bulk solid form of pure or mixed fullerenes is called fullerite. Fullerenes had been predicted for some time, but only after their accidental synthesis in 1985 were they detected in nature  and outer space. The discovery of fullerenes greatly expanded the number of known allotropes of carbon, which had previously been limited to graphite, diamond, and amorphous carbon such as soot and charcoal. They have been the subject of intense research, both for their chemistry and for their technological applications, especially in materials science, electronics, and nanotechnology. 60 in 1970. He noticed that the structure of a corannulene molecule was a subset of the shape of a soccer ball, and hypothesised that a full ball shape could also exist. Japanese scientific journals reported his idea, but neither it nor any translations of it reached Europe or the Americas. 60 structure and made a model of it. Unfortunately, the evidence for that new form of carbon was very weak at the time, so the proposal and was met with skepticism, and was never published. It was acknowledged only in 1999. 60 and calculated its electronic structure. The paper was published in 1973, but the scientific community did not gave much importance to this theoretical prediction. Around 1980, Sumio Iijima identified the molecule of C60 from an electron microscope image of carbon black, where it formed the core of a particle with the structure of a "bucky onion". 70. The team identified their structure as the now familiar "buckyballs". The name "buckminsterfullerene" was eventually chosen for C60 by the discoverers as an homage to American architect Buckminster Fuller for the vague similarity of the structure to the geodesic domes which he popularized; which, if they were extended to a full sphere, would also have the icosahedral symmetry group. The "ene" ending was chosen to indicate that the carbons are unsaturated, being connected to only three other atoms instead of the normal four. The shortened named "fullerene" eventually came to be applied to the whole family. Kroto, Curl, and Smalley were awarded the 1996 Nobel Prize in Chemistry for their roles in the discovery of this class of molecules. Kroto and the Rice team already discovered other fullerenes besides C60, and the list was much expanded in the following years. Carbon nanotubes were first discovered and synthesized in 1991. After their discovery, minute quantities of fullerenes were found to be produced in sooty flames, and by lightning discharges in the atmosphere. In 1992, fullerenes were found in a family of minerals known as shungites in Karelia, Russia.. The production techniques were improved by many scientists, including Donald Huffman, Wolfgang Krätschmer, Lowell D. Lamb, and Konstantinos Fostiropoulos. Thanks to their efforts, by 1990 it was relatively easy to produce gram-sized samples of fullerene powder. Fullerene purification remains a challenge to chemists and to a large extent determines fullerene prices. In 2010, the spectral signatures of C60 and C70 were observed by NASA's Spitzer infrared telescope in a cloud of cosmic dust surrounding a star 6500 light years away. Kroto commented: "This most exciting breakthrough provides convincing evidence that the buckyball has, as I long suspected, existed since time immemorial in the dark recesses of our galaxy." According to astronomer L. Stanghellini, "It’s possible that buckyballs from outer space provided seeds for life on Earth." There are two major families of fullerenes, with fairly distinct properties and applications: the closed buckyballs and the open-ended cylindrical carbon nanotubes. However, hybrid structures exist between those two classes, such as carbon nanobuds — nanotubes capped by hemispherical meshes or larger "buckybuds". 60 is a truncated icosahedron, which resembles an association football ball of the type made of twenty hexagons and twelve pentagons, with a carbon atom at the vertices of each polygon and a bond along each polygon edge. 60 molecule is about 0.71 nm. 60 molecule has two bond lengths. The 6:6 ring bonds (between two hexagons) can be considered "double bonds" and are shorter than the 6:5 bonds (between a hexagon and a pentagon). Its average bond length is 1.4 angstroms. 70, but fullerenes with 72, 76, 84 and even up to 100 carbon atoms are commonly obtained. 200, 15,655,672 of which have no adjacent pentagons. Optimized structures of many fullerene isomers are published and listed on the web. This rotating model of a carbon nanotube shows its 3D structure. Carbon nanotubes are cylindrical fullerenes. These tubes of carbon are usually only a few nanometres wide, but they can range from less than a micrometer to several millimeters in length. They often have closed ends, but can be open-ended as well. There are also cases in which the tube reduces in diameter before closing off. Their unique molecular structure results in extraordinary macroscopic properties, including high tensile strength, high electrical conductivity, high ductility, high heat conductivity, and relative chemical inactivity (as it is cylindrical and "planar" — that is, it has no "exposed" atoms that can be easily displaced). One proposed use of carbon nanotubes is in paper batteries, developed in 2007 by researchers at Rensselaer Polytechnic Institute. Another highly speculative proposed use in the field of space technologies is to produce high-tensile carbon cables required by a space elevator. Rings of buckyballs linked together. After the discovery of C60, many fullerenes have been synthesized (or studied theoretically by molecular modeling methods) in which some or all the carbon atoms are replaced by other elements. Inorganic nanotubes, in particular, have attracted much attention. 80 is actually more like the original geodesic dome structure popularized by Buckminster Fuller, which uses triangles rather than hexagons. However, this work has been subject to much criticism by quantum chemists as it was concluded that the predicted Ih symmetric structure was vibrationally unstable and the resulting cage undergoes a spontaneous symmetry break, yielding a puckered cage with rare Th symmetry (symmetry of a volleyball). The number of six-member rings in this molecule is 20 and number of five-member rings is 12. There is an additional atom in the center of each six-member ring, bonded to each atom surrounding it. By employing a systematic global search algorithm, later it was found that the previously proposed B80 fullerene is not global minimum for 80 atom boron clusters and hence can not be found in nature. In the same paper by Sandip De et al., it was concluded that boron's energy landscape is significantly different from other fullerenes already found in nature hence pure boron fullerenes are unlikely to exist in nature. Inorganic (carbon-free) fullerene-type structures have been built with the disulfides of molibdenum (MoS2), long used as a graphite-like lubricant, tungsten (WS2), titanium (TiS2) and niobium (NbS2). These materials were found to be stable up to at least 350 tons/cm2 (34.3 GPa). Below is a table of main closed cabon fullerenes synthesized and characterized so far, with their CAS number when known. Fullerenes with fewer than 60 carbon atoms have been called "lower fullerenes", and those with more than 70 atoms "higher fullerenes". In the table, "Num.Isom." 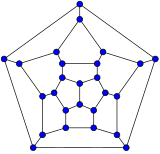 is the number of possible isomers within the "isolated pentagon rule", which states that two pentagons in a fullerene should not share edges. "Mol.Symm." is the symmetry of the molecule,, whereas "Cryst.Symm." is that of the crstalline framework in the solid state. Both are specified for the most experimentally abundant form(s). The asterisk * marks symmetries with more than one chiral form. Schlegel diagrams are often used to clarify the 3D structure of closed-shell fullerenes, as 2D projections are often not ideal in this sense. In mathematical terms, the combinatorial topology (that is, the carbon atoms and the bonds between them, ignoring their positions and distances) of a closed-shell fullerene with a simple sphere-like mean surface (orientable, genus zero)can be represented as a convex polyhedron; more precisely, its one-dimensional skeleton, consisting of its vertices and edges. The Schlegel diagram is a projection of that skeleton onto one of the faces of the polyhedron, through a point just outside that face; so that all other vertices project inside that face. 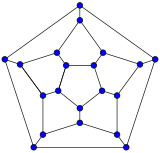 The Schlegel diagram of a closed fullerene is a graph that is planar and 3-regular (or "cubic"; meaning that all vertices have degree 3. 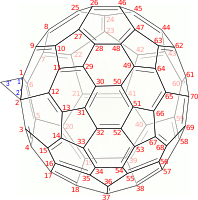 A closed fullerene with sphere-like shell must have at least some cycles that are pentagons or heptagons. More precisely, if all the faces have 5 or 6 sides, it follows from Euler's polyhedron formula, V−E+F=2 (where V, E, F are the numbers of vertices, edges, and faces), that V must be even, and that there must be exactly 12 pentagons and V/2−10 hexagons. Similar constraints exist if the fullerene has heptagonal (seven-atom) cycles. Open fullerenes, like carbon nanotubes and graphene, can consist entirely of hexagonal rings. In theory, a long nanotube with ends joined to form a closed torus-like sheet could also consist entirely of hexagons. Since each carbon atom is connected to only three neighbors, instead of the usual four, it is customary to describe those bonds as being a mixture of single and double covalent bonds. So-called endohedral fullerenes have ions or small molecules incorporated inside the cage atoms. In the early 2000s, the chemical and physical properties of fullerenes were a hot topic in the field of research and development. Popular Science discussed possible uses of fullerenes (graphene) in armor. Fullerene is an unusual reactant in many organic reactions such as the Bingel reaction discovered in 1993. 60 trying to form a loose metallic bond. 84, which violates the isolated pentagon rule. Recent evidence for a meteor impact at the end of the Permian period was found by analyzing noble gases so preserved. Metallofullerene-based inoculates using the rhonditic steel process are beginning production as one of the first commercially viable uses of buckyballs. Fullerenes are soluble in many organic solvents, such as toluene, chlorobenzene, and 1,2,3-trichloropropane. Solubilities are generally rather low, like 8 g/L for C60 in carbon disulfide. 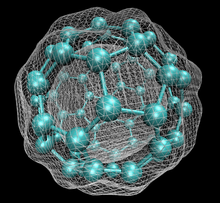 still, fullerenes are the only known allotrope of carbon that can be dissolved in common solvents at room temperature. Among the best solvents is 1-chloronaphthalene, which will dissolve 51 g/L of C60. 84 have a variety of colors. Fullerenes are normally electrical insulators, but when crystallized with alkali metals, the resultant compound can be conducting or even superconducting. 84) are inherently chiral because they are D2-symmetric, and have been successfully resolved. Research efforts are ongoing to develop specific sensors for their enantiomers. 60-Ih)[5,6]fullerene. The name of the point group should be retained in any derivative of said fullerene, even if that symmetry is lost by the derivation. To indicate the position of substituted or attached elements, the fullerene atoms are usually numbered in spiral pathway, usually starting with the ring on one of the main axes. If the structure of the fullerene does not allow such numbering, another starting atom was chosen to still achieve a spiral path sequence. 70-D5h(6))[5,6]fullerene in IUPAC notation. The symmetry D5h(6) means that this is the isomer where the C5 axis goes through a pentagon surrounded by hexagons rather than pentagons. Non-equivalent bonds shown by different colours. 2–, the resulting structure is a homofullerene. If an atom is fully deleted and missing valences saturated with hydrogen atoms, it is a norfullerene. When bonds are removed (both sigma and pi), the compound becomes secofullerene; if some new bonds are added in an unconventional order, it is a cyclofullerene. Fullerene production generally starts by producing fullerene-rich soot. The original (and still current) method was to send a large electric current between two nearby graphite electrodes in an inert atmosphere. The resulting electric arc vaporizes the carbon into a plasma that then cools into sooty residue. Alternatively, soot is produced by laser ablation of graphite or pyrolysis of aromatic hydrocarbons. Combustion is the most efficient process, developed at MIT. These processes yield a mixture of various fullerenes and other forms of carbon. The fullerenes are then extracted from the soot using appropriate organic solvents and separated by chromatography. :p.369 One can obtain milligram quantities of fullerenes with 80 atoms or more. C76, C78 and C84 are available commercially. In April 2003, fullerenes were under study for potential medicinal use: binding specific antibiotics to the structure to target resistant bacteria and even target certain cancer cells such as melanoma. The October 2005 issue of Chemistry & Biology contained an article describing the use of fullerenes as light-activated antimicrobial agents. 60 derivatives can be delivered to the cells by using the functional groups L-phenylalanine, folic acid, and L-arginine among others. Functionalizing the fullerenes aims to increase the solubility of the molecule by the cancer cells. Cancer cells take up these molecules at an increased rate because of an upregulation of transporters in the cancer cell, in this case amino acid transporters will bring in the L-arginine and L-phenylalanine functional groups of the fullerenes. 60 derivatives would react to light radiation by turning molecular oxygen into reactive oxygen which triggers apoptosis in the HeLa cells and other cancer cells that can absorb the fullerene molecule. This research shows that a reactive substance can target cancer cells and then be triggered by light radiation, minimizing damage to surrounding tissues while undergoing treatment. The authors therefore recommend assessing the pharmacology of every new fullerene- or metallofullerene-based complex individually as a different compound. 60 as the second 'o' in their logo to celebrate the 25th anniversary of the discovery of the fullerenes. ^ a b Buseck, P.R. ; Tsipursky, S.J. ; Hettich, R. (1992). "Fullerenes from the Geological Environment". Science. 257 (5067): 215–7. Bibcode:1992Sci...257..215B. doi:10.1126/science.257.5067.215. PMID 17794751. ^ a b "The allotropes of carbon". Interactive Nano-Visualization in Science & Engineering Education. Archived from the original on 18 June 2010. Retrieved 29 August 2010. 70 in a Young Planetary Nebula". Science. 329 (5996): 1180–2. Bibcode:2010Sci...329.1180C. doi:10.1126/science.1192035. PMID 20651118. ^ a b Stars reveal carbon 'spaceballs', BBC, 22 July 2010. ^ Schultz, H.P. (1965). "Topological Organic Chemistry. Polyhedranes and Prismanes". Journal of Organic Chemistry. 30 (5): 1361–1364. doi:10.1021/jo01016a005. ^ Osawa, E. (1970). "Superaromaticity". Kagaku. 25: 854–863. ^ Halford, B. (9 October 2006). "The World According to Rick". Chemical & Engineering News. 84 (41): 13–19. doi:10.1021/cen-v084n041.p013. ^ Thrower, P.A. (1999). "Editorial". Carbon. 37 (11): 1677–1678. doi:10.1016/S0008-6223(99)00191-8. ^ Henson, R.W. "The History of Carbon 60 or Buckminsterfullerene". Archived from the original on 15 June 2013. ^ Bochvar, D.A. ; Galpern, E.G. (1973). "О гипотетических системах: карбододекаэдре, s-икосаэдре и карбо-s-икосаэдре" [On hypothetical systems: carbon dodecahedron, S-icosahedron and carbon-S-icosahedron]. Dokl. Akad. Nauk SSSR. 209: 610. ^ Iijima, S (1980). "Direct observation of the tetrahedral bonding in graphitized carbon black by high resolution electron microscopy". Journal of Crystal Growth. 50 (3): 675–683. Bibcode:1980JCrGr..50..675I. doi:10.1016/0022-0248(80)90013-5. 60: Buckminsterfullerene". Nature. 318 (6042): 162–163. Bibcode:1985Natur.318..162K. doi:10.1038/318162a0. ^ "The Nobel Prize in Chemistry 1996". Retrieved 7 February 2014. ^ Mraz, S.J. (14 April 2005). "A new buckyball bounces into town". Machine Design. Archived from the original on 13 October 2008. ^ Atkinson, Nancy (27 October 2010). "Buckyballs Could Be Plentiful in the Universe". Universe Today. Retrieved 28 October 2010. ^ a b Miessler, G.L. ; Tarr, D.A. (2004). Inorganic Chemistry (3rd ed.). Pearson Education. ISBN 978-0-13-120198-9. 60 and Its Derivatives Across a Lipid Bilayer". Nano Letters. 7 (3): 614–9. Bibcode:2007NanoL...7..614Q. CiteSeerX 10.1.1.725.7141. doi:10.1021/nl062515f. PMID 17316055. ^ Locke, W. (13 October 1996). "Buckminsterfullerene: Molecule of the Month". Imperial College. Retrieved 4 July 2010. ^ Meija, Juris (2006). "Goldberg Variations Challenge" (PDF). Analytical and Bioanalytical Chemistry. 385 (1): 6–7. doi:10.1007/s00216-006-0358-9. PMID 16598460. ^ Charles Gause. "Fullerene Nanomedicines for Medical and Healthcare Applications". ^ "Luna Inc. Organic Photovoltaic Technology". 2014. Archived from the original on 28 March 2014. ^ Pushparaj, V.L. ; Shaijumon, Manikoth M.; Kumar, A.; Murugesan, S.; Ci, L.; Vajtai, R.; Linhardt, R. J.; Nalamasu, O.; Ajayan, P. M. (2007). "Flexible energy storage devices based on nanocomposite paper". Proceedings of the National Academy of Sciences. 104 (34): 13574–7. Bibcode:2007PNAS..10413574P. doi:10.1073/pnas.0706508104. PMC 1959422. PMID 17699622. ^ Ugarte, D. (1992). "Curling and closure of graphitic networks under electron-beam irradiation". Nature. 359 (6397): 707–709. Bibcode:1992Natur.359..707U. doi:10.1038/359707a0. PMID 11536508. ^ Sano, N.; Wang, H.; Chhowalla, M.; Alexandrou, I.; Amaratunga, G. A. J. (2001). 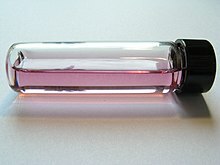 "Synthesis of carbon 'onions' in water". Nature. 414 (6863): 506–7. Bibcode:2001Natur.414..506S. doi:10.1038/35107141. PMID 11734841. ^ Mitchel, D.R. ; Brown, R. Malcolm Jr. (2001). "The Synthesis of Megatubes: New Dimensions in Carbon Materials". Inorganic Chemistry. 40 (12): 2751–5. doi:10.1021/ic000551q. PMID 11375691. ^ Shvartsburg, A.A.; Hudgins, R. R.; Gutierrez, Rafael; Jungnickel, Gerd; Frauenheim, Thomas; Jackson, Koblar A.; Jarrold, Martin F. (1999). "Ball-and-Chain Dimers from a Hot Fullerene Plasma" (PDF). Journal of Physical Chemistry A. 103 (27): 5275–5284. Bibcode:1999JPCA..103.5275S. doi:10.1021/jp9906379. 60-rings". Chemical Physics Letters. 335 (5–6): 524–532. Bibcode:2001CPL...335..524L. doi:10.1016/S0009-2614(01)00064-1. 80 Fullerene: An Ab Initio Prediction of Geometry, Stability, and Electronic Structure". Physical Review Letters. 98 (16): 166804. Bibcode:2007PhRvL..98p6804G. doi:10.1103/PhysRevLett.98.166804. PMID 17501448. ^ a b Gopakumar, G.; Nguyen, M.T. ; Ceulemans, A. (2008). "The boron buckyball has an unexpected Th symmetry". Chemical Physics Letters. 450 (4–6): 175–177. arXiv:0708.2331. Bibcode:2008CPL...450..175G. doi:10.1016/j.cplett.2007.11.030. ^ Prasad, D.; Jemmis, E. (2008). "Stuffing Improves the Stability of Fullerenelike Boron Clusters". Physical Review Letters. 100 (16): 165504. Bibcode:2008PhRvL.100p5504P. doi:10.1103/PhysRevLett.100.165504. PMID 18518216. ^ De, S.; Willand, A.; Amsler, M.; Pochet, P.; Genovese, L.; Goedecker, S. (2011). "Energy Landscape of Fullerene Materials: A Comparison of Boron to Boron Nitride and Carbon". Physical Review Letters. 106 (22): 225502. arXiv:1012.3076. Bibcode:2011PhRvL.106v5502D. doi:10.1103/PhysRevLett.106.225502. PMID 21702613. ^ Genuth, Iddo; Yaffe, Tomer (15 February 2006). "Protecting the soldiers of tomorrow". IsraCast. ^ W. L. F. Armarego; Christina Li Lin Chai (11 May 2009). Purification of laboratory chemicals. Butterworth-Heinemann. pp. 214–. ISBN 978-1-85617-567-8. Retrieved 26 December 2011. ^ Margadonna, Serena; Brown, Craig M.; Dennis, T. John S.; Lappas, Alexandros; Pattison, Philip; Prassides, Kosmas; Shinohara, Hisanori (July 1998). "Crystal Structure of the Higher Fullerene C". Chemistry of Materials. 10 (7): 1742–1744. doi:10.1021/cm980183c. ^ Manolopoulos, David E.; Fowler, Patrick W. (1991). "Structural proposals for endohedral metal-fullerene complexes". Chemical Physics Letters. 187: 1. doi:10.1016/0009-2614(91)90475-O. ^ Diederich, Francois; Whetten, Robert L. (1992). "Beyond C60: The higher fullerenes". Accounts of Chemical Research. 25 (3): 119. doi:10.1021/ar00015a004. ^ K Veera Reddy (1 January 1998). Symmetry And Spectroscopy Of Molecules. New Age International. pp. 126–. ISBN 978-81-224-1142-3. Retrieved 26 December 2011. 76 crystals studied by x-ray diffraction". Physical Review B. 51 (14): 8723. doi:10.1103/PhysRevB.51.8723. ^ Erik Sofge (12 February 2014). "How Real Is 'RoboCop'?". Popular Science. ^ Johansson, M.P. ; Jusélius, J.; Sundholm, D. (2005). "Sphere Currents of Buckminsterfullerene". Angewandte Chemie International Edition. 44 (12): 1843–6. doi:10.1002/anie.200462348. PMID 15706578. ^ Hiorns, R.C. ; Cloutet, Eric; Ibarboure, Emmanuel; Khoukh, Abdel; Bejbouji, Habiba; Vignau, Laurence; Cramail, Henri (2010). "Synthesis of Donor-Acceptor Multiblock Copolymers Incorporating Fullerene Backbone Repeat Units". Macromolecules. 14. 43 (14): 6033���6044. Bibcode:2010MaMol..43.6033H. doi:10.1021/ma100694y. 60: Comparison with diamond on hardness and wear". Diamond and Related Materials. 7 (2–5): 427–431. Bibcode:1998DRM.....7..427B. CiteSeerX 10.1.1.520.7265. doi:10.1016/S0925-9635(97)00232-X. 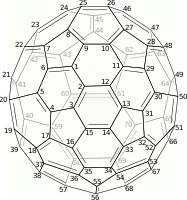 84: An improbable, egg-shaped endohedral fullerene that violates the isolated pentagon rule". Journal of the American Chemical Society. 128 (35): 11352–3. doi:10.1021/ja063636k. PMID 16939248. ^ Luann, B.; Poreda, Robert J.; Hunt, Andrew G.; Bunch, Theodore E.; Rampino, Michael (2007). "Impact Event at the Permian-Triassic Boundary: Evidence from Extraterrestrial Noble Gases in Fullerenes". Science. 291 (5508): 1530–3. Bibcode:2001Sci...291.1530B. doi:10.1126/science.1057243. PMID 11222855. 60". Fullerenes, Nanotubes and Carbon Nanostructures. 5 (2): 291–310. doi:10.1080/15363839708011993. 60) in a variety of solvents" (PDF). Journal of Physical Chemistry. 97 (13): 3379–3383. doi:10.1021/j100115a049. 70 in Organic Solvents". Fullerene Science and Technology. 2 (3): 233–246. doi:10.1080/15363839408009549. ^ Semenov, K. N.; Charykov, N. A.; Keskinov, V. A.; Piartman, A. K.; Blokhin, A. A.; Kopyrin, A. A. (2010). "Solubility of Light Fullerenes in Organic Solvents". Journal of Chemical & Engineering Data. 55: 13–36. doi:10.1021/je900296s. 6H6 in Liquid Benzene". Journal of Physical Chemistry B. 101 (47): 9679–9681. doi:10.1021/jp9720303. 70 in Benzene, Hexane, and Toluene Solutions". Journal of Physical Chemistry B. 102 (34): 6477–6481. doi:10.1021/jp9815255. 60" (PDF). Nature. 401 (6754): 680–2. Bibcode:1999Natur.401..680A. doi:10.1038/44348. PMID 18494170. ^ Katz, E. A. (2006). "Fullerene Thin Films as Photovoltaic Material". In Sōga, Tetsuo (ed.). Nanostructured materials for solar energy conversion. Elsevier. pp. 372, 381. ISBN 978-0-444-52844-5. ^ Zhang, J.; Bowles, F. L.; Bearden, D. W.; Ray, W. K.; Fuhrer, T.; Ye, Y.; Dixon, C.; Harich, K.; Helm, R. F.; Olmstead, M. M.; Balch, A. L.; Dorn, H. C. (2013). "A missing link in the transformation from asymmetric to symmetric metallofullerene cages implies a top-down fullerene formation mechanism". Nature Chemistry. 5 (10): 880–885. Bibcode:2013NatCh...5..880Z. doi:10.1038/nchem.1748. PMID 24056346. ^ Osawa, Eiji (2002). Perspectives of Fullerene Nanotechnology. Springer Science & Business Media. pp. 29–. ISBN 978-0-7923-7174-8. ^ Arikawa, Mineyuki (2006). "Fullerenes—an attractive nano carbon material and its production technology". Nanotechnology Perceptions. 2 (3): 121–128. ISSN 1660-6795. ^ Katz, E. A. (2006). "Fullerene Thin Films as Photovoltaic Material". In Sōga, Tetsuo (ed.). Nanostructured materials for solar energy conversion. Elsevier. pp. 361–443. doi:10.1016/B978-044452844-5/50014-7. ISBN 978-0-444-52844-5. ^ Tegos, G. P.; Demidova, T. N.; Arcila-Lopez, D.; Lee, H.; Wharton, T.; Gali, H.; Hamblin, M. R. (2005). "Cationic Fullerenes Are Effective and Selective Antimicrobial Photosensitizers". Chemistry & Biology. 12 (10): 1127–1135. doi:10.1016/j.chembiol.2005.08.014. PMC 3071678. PMID 16242655. ^ a b Brown, S.B. ; Brown, E.A. ; Walker, I. (2004). "The present and future role of photodynamic therapy in cancer treatment". Lancet Oncology. 5 (8): 497–508. doi:10.1016/S1470-2045(04)01529-3. PMID 15288239. ^ Mroz, Pawel; Pawlak, Anna; Satti, Minahil; Lee, Haeryeon; Wharton, Tim; Gali, Hariprasad; Sarna, Tadeusz; Hamblin, Michael R. (2007). "Functionalized fullerenes mediate photodynamic killing of cancer cells: type I versus typee II photochemical mechanism". Free Radical Biology & Medicine. 43 (5): 711–719. doi:10.1016/j.freeradbiomed.2007.05.005. PMC 1995806. PMID 17664135. ^ Ganapathy, Vadivel; Thanaraju, Muthusamy; Prasad, Puttur D. (2009). "Nutrient transporters in cancer: Relevance to Warburg hypothesis and beyond". Pharmacology & Therapeutics. 121 (1): 29–40. doi:10.1016/j.pharmthera.2008.09.005. PMID 18992769. 60 derivatives and their biological consequences in a HeLa cell line". Chemico-Biological Interactions. 195 (1): 86–94. doi:10.1016/j.cbi.2011.11.003. PMID 22108244. ^ Markovic, Zoran; Trajkovic, Vladimir (2008). "Biomedical potential of the reactive oxygen species generation and quenching by fullerenes". Biomaterials. 29 (26): 3561–3573. doi:10.1016/j.biomaterials.2008.05.005. PMID 18534675. ^ Jones, D. (1966). "Note in Ariadne column". New Scientist. 32: 245. ^ Google doodle marks buckyball anniversary. The Guardian. 4 September 2010. 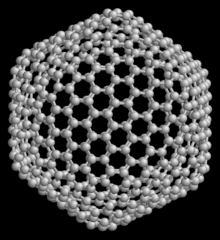 Nanocarbon: From Graphene to Buckyballs Interactive 3D models of cyclohexane, benzene, graphene, graphite, chiral & non-chiral nanotubes, and C60 Buckyballs - WeCanFigureThisOut.org.